K. Dot spoke on his January White House visit before his Brooklyn show this weekend. Kendrick Lamar performed at a "secret," AmEx-sponsored show in Williamsburg this weekend, and before hopping on stage, he spoke with XXL for a quick interview. Specifically, XXL took the chance to ask Kendrick about his thoughts on President Obama's eight years in office, and about his January meeting with the President, during which the two apparently developed a friendly rapport. “You look at him as such a high figure in the world, but for him to embrace you and have a connection with you further than just being the President and make you feel like an actual friend...That’s probably the best moment and one of his best characteristics," said Kendrick. 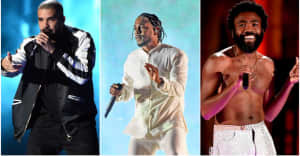 Kendrick also described his admiration for the President's decision to invite a huge group of hip-hop luminaries to the White House this August to discuss his My Brother's Keeper Initiative. “I think the world, not just hip-hop owes him,” he said. “We all have to give him his credit due for even allowing us into the building. We would probably never get inside that house ever again...Rick Ross, Cole, Nicki Minaj, he really went for us to come experience it. This is something our grandparents always wanted to see, never thought [was possible] in a million years." Read more from the interview here, via XXL.